Oh, it’s so hard to know what to say about this. All the fine folk who went out running today, whose goal was to test their own spirit and endurance, and who now find themselves facing tests they never imagined when the day began. All the men and women and children who went out to cheer on friends and family and strangers, and who found themselves screaming instead. Does this one hit home more because it’s an endurance athletic event that was targeted, something that sits very close to my own heart even though I’m not a runner? I thought so at first, but now I’m not so sure. What hits home is that no-one should ever set out for a run on a fine spring morning and have their day end in fire and smoke and anguish. No-one should embark on a perfectly ordinary morning commute and find themselves haunted and howling in the bloodied wreckage of a train. No-one should take their seat at their work desk only to have passenger planes turn into weapons and rain fire down upon them from the sky. Innocent people should not be hurt. Human beings should not do this to one another. And then there are the people who ran into the smoke instead of away from it, the first responders, the Boston families and businesses that opened up and offered whatever help was needed. That’s what I want to remember about this. Not the pointless hatred that inflicted such needless suffering on innocent people, but the kindness and bravery of strangers. I wish more than anything that such a tragedy would never happen again. But I don’t believe that will be true in my lifetime, if ever. So for now I just wish that in the wake of such unspeakable horror, goodness prevails the way it did today. My heart goes out to all of them, every one, the runners who ran and ran and ran and in a moment that should have been glorious, found only chaos and pain beyond imagining. This entry was posted in Other Sports on April 15, 2013 by Kay. Yesterday morning, Felix Baumgartner fell from an unimaginably great height to the surface of the earth. He dropped from a tiny capsule into the stratosphere, where for horribly long moments he tumbled out of control, tomahawking through the sky. And then he stabilized, smashed through the sound barrier, and eventually pulled his chute and coasted to the gentlest of landings in the desert. He stepped onto the ground as though he were hopping down from a kerb on a Sunday afternoon stroll, not recovering from the furthest fall a human being has ever taken. I was glued to the livestream as Baumgartner ascended, listening to Joe Kittinger’s reassuring voice keep him company through those lonely miles. The moment when the capsule door opened and the dark blue stratosphere and the curve of the earth suddenly became visible took my breath away. Watching him run through his final checks and then slide forward, his foot shaking just a tiny bit as it exited the capsule, was nerve-wracking. And then all the checks were complete and he stood up on that miniscule platform in the sky, nothing tethering him, higher than anyone. 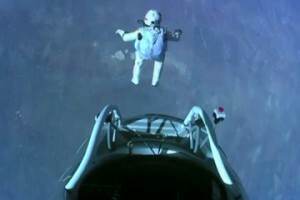 What must it have been like to be Felix Baumgartner at that moment? So far from the world, with only one way back. “I’m going home now,” he said, and then he stepped forward and fell away into the void.  We watched with our hearts in our mouths as the tiny figure on the infrared tumbled and span, so obviously out of control. I’ve been following the story of the Stratos jump for a long time, so I knew the risks of a flat spin and could see how close he was to that line. We let ourselves breathe just a tiny bit as he regained control and stabilized, even as those astonishing numbers tracking his speed continued to climb. We cheered when his chute opened, and hugged when it flared and he made that perfect step down into the desert. When he fell to his knees on the sand I wanted to fall with him, in celebration and in awe. You can argue all you want about the commercialism, the Red Bull logos, the amount of money ploughed into the jump. (Steve Casimiro’s Adventure Journal article sums up that side of it better than I could.) The jump had scientific value, it’s true: but in the end, for me, it’s less about that than human endeavour. First and foremost it’s about a man who was willing to push boundaries that have never been tested, to go so far beyond what anyone has ever done before, and to show once again that our minds and bodies are capable of so much more than we can imagine. What I witnessed on my computer screen yesterday morning was, quite simply, one of the most extraordinary things I’ve ever seen. There’s something incredible, too, about the shared nature of this event. We were just two of a staggering eight million people watching Felix fall to earth. I had a second browser window open, squished into a small corner of the screen, with conversations running on Twitter and Facebook with numerous friends who were also watching the jump. (“Damn fool,” said one. “Get back in there!” said another. “Believe!” I said.) Because it was happening live – albeit with a 20-second delay in case of catastrophe – we were able to share in the journey in a way that wouldn’t have been possible if we’d heard about the successful jump and then seen the footage later. That was the way the news used to happen. It makes me grateful to live in a time of such accelerated change, when we have the contrasts to appreciate just how far we’ve come. It’s amazing that someone was willing and able to do such a thing, and that the technology existed to enable him to proceed. It’s equally amazing that eight million of us were able to watch as it happened. I wonder, too, how Felix Baumgartner is feeling today. I still remember the one time I fell to earth – admittedly from a paltry 6,000 feet – and how powerfully anticlimactic being back in the world felt. It seemed unreal and wrong that after such an astonishing thing, all we did was climb in our car, drive home, and then go out for dinner and beers at a local bar. When you fall from so much further, does the gratitude for being alive and having your feet on the ground outweigh the fact that the intensity and the adrenaline are gone? I’m glad that there are people like Felix Baumgartner in the world. People who are willing to redefine the limits of the possible, to make each of us step back for a moment and reflect on our own lives and what we’re doing and where we’re investing this all too limited supply of time that we have. For his fall to earth he stands alone; but we all have the power to find things that we consider extraordinary and wonderful, and make sure that we fill as many moments with them as possible. This entry was posted in Other Sports on October 15, 2012 by Kay.